Today I have a guest post by Everyday Health. The article gives fabulous suggestions for baking healthier and some easy substitutions we can use to lessen the fat and calories in our baked goodies. When making substitutions, start with muffins or quick bread recipes. I find these recipes quite forgiving and easy to make a few switches. 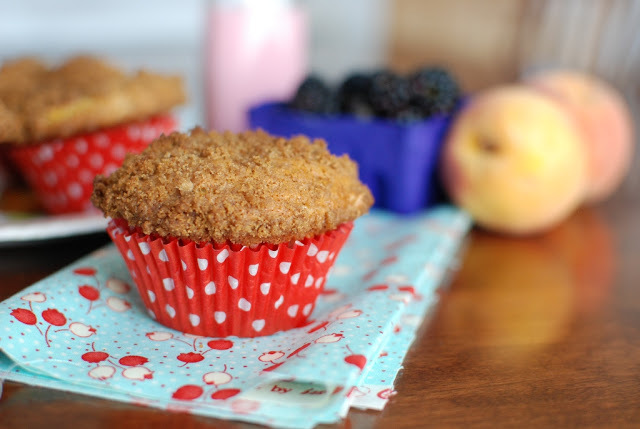 This recipe for Blackberry Peach Lavender Muffins is an easy recipe to start making substitutions. Wheat germ or flax seed can be used in the crumb topping and can replace some of the flour called for in the recipe. 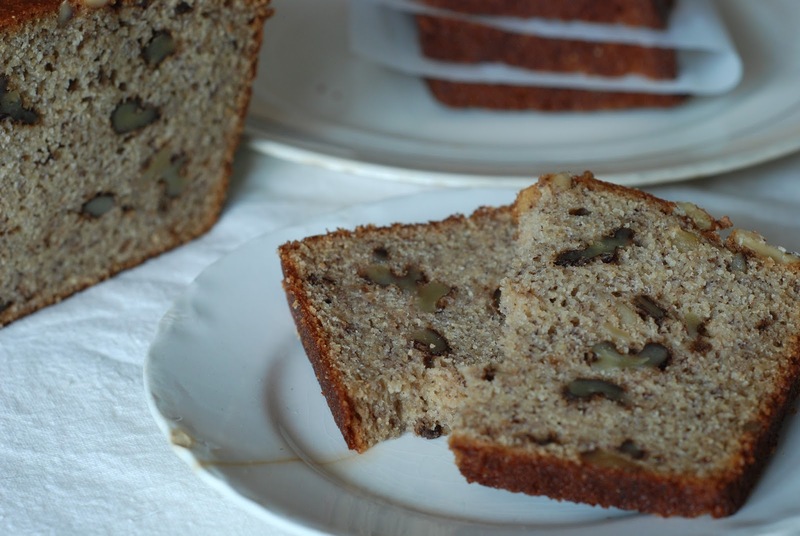 I added applesauce to replace half of the oil in this recipe for Banana Nut Bread. You’ll love the ideas and suggestions for making over your baked goods. I’m honored to have Jennifer Stinson and Everyday Health.com guest post for Simply So Good. Guest post by Jennifer Stinson, freelancer for Everyday Health.com and its recipe and calorie counter tools. With the low-carb, low sugar, gluten-free trend still in full swing, it can seem like a no-brainer to give up baking all together. I agree that cutting back on sweets is a good idea, but cutting them out completely is probably not realistic for most people. If you are someone who likes baking, but are looking for some healthier substitutions for classic recipes, then this article is for you! Recipe calls for one cup of butter, shortening or oil. Instead, use ½ cup of butter, shortening or oil and use ½ cup of applesauce or prune puree. This will cut the amount of fat in half and save you a lot of calories! When your recipe calls for cream, use evaporated skim milk instead. Evaporated skim milk is thick, and can take on the same mouth feel as full fat cream. Use an equal amount of evaporated skim milk as a substitute for cream, half and half, or lite cream. In recipes that call for whole milk, try using 1% milk in the equivalent amount to lower the fat content without sacrificing taste or texture. Pureed low fat cottage cheese can be a substitute for full fat cream cheese. Use low fat cottage cheese in the same amount called for cream cheese in the recipe. Two egg whites or ¼ cup of egg substitute can replace a whole egg. For a vegan option, use one tablespoon flaxseed meal combined with three tablespoons of water for each egg. Reducing eggs in recipes not only reduces the fat, but dietary cholesterol. Since you’re changing up the recipe quite a bit calorie-wise use a calorie app, similar to Everyday Health’s Calorie Counter, to come up with new nutrition and calorie information for your made over recipe. Flaxseed meal is a great addition to any recipe. Flaxseed is rich in omega-3 fatty acids, fiber and other essential nutrients like magnesium. Since flaxseed meal has such a high concentration of oil, it is a great substitution for eggs and fat, but also a great way to replace flour and add some additional fiber. To replace some of the regular white flour in your recipe for bread, muffins, pastries, and cookies, reduce the flour by 25 percent and swap for flaxseed meal. For example, if a recipe calls for 1 cup of flour, use ¾ cup of flour and ¼ cup of flaxseed meal instead. When you replace regular flour with flaxseed meal, you will get a slightly nutty flavor and a golden brown color to your finished product. There are many popular artificial sweeteners you can bake with these days, but what people don’t know is that you can often reduce the amount of sugar by one-half in most recipes without altering the taste. Adding in vanilla extract, nutmeg or cinnamon can be added to intensify sweetness if needed. Even though these changes will make the finished product more healthy, it does not mean you can eat more of it! Try the substitutions mentioned above. Chances are, you and your most avid fans will not notice a difference. Filed Under: Uncategorized Tagged With: baking make-over, eat healthy, Everyday Health.com, healthy substitutions, step-by-step instruction, step-by-step photo's. Thank you so much for your comment. I agree it IS great advice. Great website as well for health and well being. Thanks for pinning.